King of the Damsons, also known as Bradley's King is a large-fruited purple-blue damson which ripens in September. The flavour is less astringent and slightly milder than other damsons. Unusually amongst damsons, this is a freestone fruit - the stone falls away cleanly from the flesh. Please fill in the details below and we will let you know when King of the Damsons damson trees are back in stock. Leaves turn yellow in autumn. King of the Damsons is in flowering group 2. 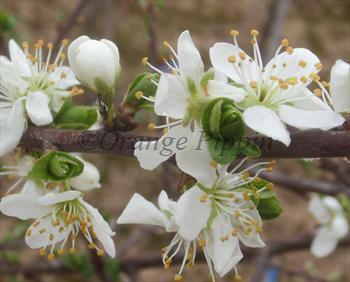 King of the Damsons is self-fertile and does not need a pollination partner, although fruiting may be improved if there is a compatible tree of a different variety nearby. Suitable for most areas of the UK.